Learn the steps to take to get a settlement (see below for average settlement values) and prove your case. If you are able, try to take immediate notice of what caused you to fall. You should see if there are any stains on your clothes, and see if anything is on the bottom of your footwear and make note of the physical characteristics of the item or substance. If possible, take pictures of where you fell and what caused you to fall. If not, have someone else take pictures of the scene. Gather the name and contact information of any witnesses (if any), including employees. Request that an incident report be prepared and that a copy be provided to you. Ask that any video surveillance be preserved. Take an ambulance to the hospital if your injuries are significant enough. Otherwise, seek medical treatment as soon as possible. Give an accurate history of what occurred to any health care provider you see. In South Florida, we enjoy a large number and variety of restaurants where we can eat breakfast, lunch, or dinner 24/7 virtually every day of the year. From fast food franchises like McDonald’s, Burger King, or Subway, to family dining spots like The Cheesecake Factory, Denny’s, Duffy’s or The Ale House, as well as upscale restaurants such as Joe’s or Prime 112, the array of restaurants in Miami, Fort Lauderdale and West Palm Beach is mind-boggling. We all have had times where we have spent an hour or more deciding where to eat. Although the only problem we usually have at a restaurant is the service or the food, slips and falls, with sometimes devastating injuries, do occur in restaurants with some degree of regularity. Often water, grease, drinks, food, and napkins find their way on to a floor. An unsuspected patron, leaving his or her table to go to the restroom or to leave the restaurant, may slip and sustain a serious injury with life-long consequences. However, injured restaurant customers are not automatically entitled to obtain compensation from the operator of the restaurant solely on account of slipping and falling as a result of some substance or item on the restaurant floor. How Does a Restaurant Have to Act? An owner and operator of a restaurant has a legal obligation to maintain the restaurant in a reasonably safe condition. The key word is REASONABLY! A restaurant operator does not have to be perfect in the care of the restaurant. Usually what constitutes reasonable care is a decision for a jury to make. For example, if a customer at the table next to someone unknowingly spills some water on the floor and no restaurant employee is there to notice it, and 5 seconds later you get up and slip on that water injuring yourself, the restaurant is probably not going to be liable for the victim’s injuries as it can’t be said to have been negligent. Negligence is the failure to use reasonable care in a timely manner. However, if it is a waitress, busboy or some other employee of the restaurant that inadvertently spilled water on the floor resulting in a slip and fall injury, then there is a much greater likelihood that a jury will conclude that the restaurant employee did not act with reasonably. That’s because the restaurant won’t be able to claim it didn’t know about the water or that it didn’t have sufficient time to discover the water. A restaurant owner is responsible for the negligent acts of its employees while working, so long as what the employee was doing was within the scope of his employment. What is Constructive Knowledge or Constructive Notice? Unfortunately, many times when a customer slips and falls on a substance on the floor, it is virtually impossible to determine whether a customer or an employee caused the dangerous condition. In these cases, the customer must somehow prove that an employee of the restaurant knew there was something on the floor and did not have it remedied or warn people of its existence, or that the substance or item on the floor was there for a sufficient length of time so that at least one employee should have known about the condition. Proving that the substance was on the floor for a sufficient length of time so that it should have been noticed by the restaurant is called “constructive knowledge or constructive notice” of the substance, in contrast to actual knowledge or notice. More and more, slip and falls are captured on restaurant or store surveillance systems. The victim should ask if the incident was captured on surveillance and insist that the restaurant preserve it as well as the period one or two hours before the incident. With this evidence, it may be possible to prove how long the substance was on the floor and how it came to be on the floor. Surveillance systems are on a continuous loop and the incident may be erased within 24-48 hours. The lawyer the victim hires will ask the restaurant or its insurance company for the surveillance but many times that request is not made for days or weeks after the incident as most people do not hire lawyers until the nature and extent of the injuries are known. At restaurants like The Cheesecake Factory, the floor always seems to be slippery. Sometimes there are claims based on the type of flooring used or the type of waxing or floor polishing that is used created an unsafe condition. Again, a victim should try to take note of the surface of the floor, even if he/she is in pain. The restaurant owner knows that from time to time there will be liquid substances on the floor and may have a duty to install flooring that is non-slip. We all have been on surfaces that seem like ice when they are wet and others that seem safe even if wet. Even though one may not be able to prove for how long a liquid was on the floor or how it came to be on the floor, the restaurant may have a history of slip and falls that can be attributable partly due to the slipperiness of the floor itself. A measurement called the coefficient of friction reveals just how slippery a floor is, although unless the coefficient of friction test is performed shortly after an incident, it may not be admissible in court. 3. Was There a Warning Sign? The restaurant has a duty to clean their floors, and/or it has a duty to place a warning sign of an unsafe condition as soon as the defendant knows that the grease is on the floor. If, for example, a waiter drops a tray and grease or water gets on the floor and you slip and fall before the waiter has a reasonable amount of time to get back and clean the area or place a warning cone, then the fact that there is not a warning sign when you fell does not automatically mean the restaurant is legally liable. However, if that waiter dropped the tray and spilled grease or water on the floor and then you slipped in that grease 30 minutes later — and no one has bothered to place a warning sign during that half-hour, then the failure to place that warning sign is evidence that the restaurant breached its duty and evidence of their negligence. 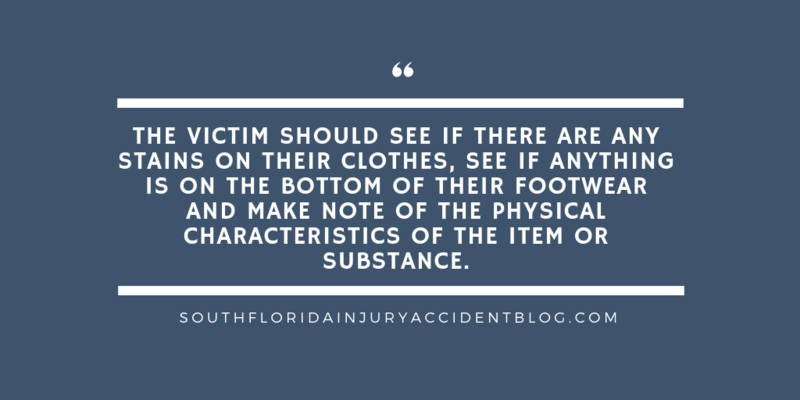 Obviously, as with every slip and fall case, the particular circumstances of a situation, including the ability to prove facts, are key to whether or not a viable legal injury claim can be brought under Florida law. What Kind of Compensation Can A Victim Recover If a Restaurant Breached Its Duty of Care? What Are Some Restaurant Defenses? Defense lawyers are notorious in slip and fall cases for pointing the finger of blame at the person who fell. In any restaurant case where alcoholic beverages are served, there will be the argument that the victim contributed to their accident by having a drink or two with their meal. Also, in rain-related slip and falls, injury victims are likely to face arguments that they weren’t careful enough in walking in rainy areas. They were running to the car, for instance, or they failed to use the handrail that was provided. Shoes with high heels or flats like flip flops will be used against the victim as contributing factors to a slip and fall on a floor made slippery by rain. A good piece of advice if you have been injured in a restaurant slip and fall is to speak with an experienced lawyer before you file a claim to learn about some of the issues that can arise with these claims, including the type of evidence needed to prove a claim and the type and amount of damages you can recover. Most personal injury lawyers, like Alan Sackrin, will offer a free initial consultation (over the phone or in person) to evaluate your claim and answer your questions.